Roman Catholicism is the official, traditional and dominant religion in Costa Rica. After the government, the Catholic Church is the most powerful institution in the country. Since 1949, the Costa Rican Constitution provides freedom of religion as well as other laws and policies that contribute to the overall free practice of religion. According to annual International Religious Freedom Reports of the US government, the Costa Rican Government generally respects religious freedom in practice. There are few reports of societal abuses or discrimination based on religious affiliation, belief or practice. Prominent societal leaders generally take positive steps to promote religious freedom. In 2011, the University of Costa Rica published the latest survey on Costa Rican demographics in which it has estimated that 47 percent of the adult population identify themselves as practicing Roman Catholics, 23 percent as non-practicing Catholics, 16 percent as evangelical Protestants, 6 percent as belonging to other religions, and 8 percent as having no religious affiliation. Although the Caribbean coast was the first that was ‘discovered’ by Christopher Colombo in 1502, the first explorations and settlements of the Spanish ‘conquistadores’ in Costa Rica were on the Pacific coast, in the Nicoya Peninsula, where several thousands of Chorotega Indians accepted Roman Catholicism. Nicoya village is the site of the first Roman Catholic church on Costa Rican ground, erected in 1544. Other parts of Costa Rica at the time were inhabited by scattered indigenous groups in low numbers. They were almost annihilated by various European diseases, carried on by advancing Spanish settlers. In 1563, Juan Vásquez de Coronado, first governor of Costa Rica, established Cartago in the Central Valley as the national capital. Once all the gold was shipped to Spain, Costa Rica fell on the coattails of Spanish colonial system, and the low numbers of its indigenous population helped remain there for more than a century. Semi-integration of Church and State was rooted in the simultaneous introduction of Christianity and military conquest of the colony as the church was guaranteed a privileged position in the society and had monopoly over education. Although there were opposing opinions among clergy on the proclamation of the Independence in 1847, political tensions surrounding the movement were low due to Costa Rica’s geographic isolation and relative weakness of the traditional oligarchy. The first Costa Rica constitutive law—‘Ley Fundamental’—declared Catholicism the official state religion and guaranteed its protection by the State. This was reconfirmed in the latter 1847 Constitution, prohibiting the practice of other religions at the same time, but it recognized the right of other cults. In order to attract immigrants from Europe and the United States, the Constitution was altered again in 1879, explicitly guaranteeing religious toleration. The Diocese of Costa Rica was established in 1850, which further consolidated country’s independence. Catholicism was recognized as the official state religion in Costa Rica. Catholic education was guaranteed and the State was obliged to assume financial support of the Church and assist in the propagation of the faith. The Church’s right to possess and acquire property and establish monasteries was acknowledged. The phenomenon of the Church forming its own party is unique in Central America and has remained a tool of political expression even nowadays. Due to the formation of political groupings around personalities rather than emergence of any strong conservative party, the Church had no one to turn to, to defend its interests and simply formed its own party in 1894. Recognizing the importance of the Church’s support, Liberal governments for the following 40 years avoided confrontations with it. The Church limited itself to purely religious functions and practically ignored rising social problems. The crisis of the agro-export model in the 1940s led to social reforms, implemented by Calderon’s social Christian political project, which was embraced and supported by the newly installed Archbishop Sanabria. This support completely overturned the Church’s political discourse on social matters at the time and was essential to the success of the social reforms in the economically struggling country. The religious social orientation was weakened somewhat after Sanabria’s death in 1952, after which the Partido Liberación Nacional, characterized by its conservatism, dominated the political arena and frowned on liberal social organizations. Following a long period of silence under Sanabria’s successor, the Church addressed pressing social matters again in the late 70s, with a feeble attempt to cure the symptom, rather than the cause of the crisis. Although the Government continues to maintain a close relationship with the Catholic Church, 47% of the Costa Rican population expressed that they would rather live in a secular state, according to recent survey by Unimer, conducted for the newspaper La Nación in March 2013. This is a 7% increase of the number recorded in the poll two years prior—41%. A majority of the people simply do not have a strong identification with the church or with its teachings and 30% of those surveyed in the most recent poll said they didn’t care if Costa Rica has an official religion or if it was secular. The 1880s mark the earliest Protestant missionary efforts in Costa Rica, guided by English speaking West Indians. They settled on the Caribbean coast after one of the biggest development projects ever endeavored in Costa Rica—construction of the railroad connecting the Central Valley and the Caribbean. The growth of the Protestant Movement, especially since the 1960s has led to the current state of ‘religious pluralism’. Approximately 92 percent of Protestants are Pentecostal and 8 percent are Baptist. A Community of Quakers from the U.S. state of Alabama moved to Costa Rica in the 1950s and founded the town of Monteverde, as well as the Monteverde Cloud Forest Biological Reserve. The Church of Jesus Christ of Latter-day Saints (Mormons) estimates its membership at 35,000. The Lutheran Church estimates it has 5,500 members. 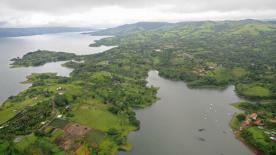 The Jewish Zionist Center estimates that there are 2,800 Jews in Costa Rica. Although they represent less than one percent of the population, Jehovah’s Witnesses have a strong presence on the Caribbean coast. Seventh-day Adventists operate a university that attracts students from throughout the Caribbean Basin. The Unification Church has its headquarters for Latin America in San Jose. Other religious groups include followers of Islam, Taoism, Krishna Consciousness, Scientology, Tenrikyo, and the Bahai Faith. 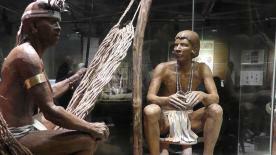 Indigenous people are more likely than non-indigenous people to practice animism. Churches represent one of the most endearing architecture displays in Costa Rica. The different styles, materials and periods represented in the buildings can be seen as journey through the country’s history. On top of this, most of them have become icons, thus cultural and religious local activities take place around them. Churches also have taken and important role shaping the identity of Costa Rican towns. The legend of the Virgin of Los Angeles, made this cathedral the icon of the Costa Rican Catholic Church. The beautiful complex was erected in 1781 by a group of Spanish settlers, and houses “La Negrita”, the legendary figurine of Costa Rica’s patron saint, La Virgen de los Angeles. Every August 2nd thousands set off on a pilgrimage, and walk from all parts of Costa Rica to Cartago, to commemorate the first miraculous appearance of La Negrita statue in 1635. Located in Coronado, this church is a priceless architecture work inspired in the neo-gothic trends. The exquisite details in the Church portray the main characteristics of the gothic style, including the pointing arches, height and majesty. While sightseeing in San Jose, a great stop is the Metropolitan Cathedral located in the heart of the capital, a few blocks from the National Theater and across the street from the lovely Melico Salazar Theater. The original church, built in 1871, was destroyed in an earthquake and the current structure has a mixture of styles. This magnificent church with gothic features took a long time to build. The process started since 1925 and was consecrated in 1954. The church was entirely built by the manpower of the locals. The design as well as the materials came directly from Germany and were transported from the coast to San Ramon—on the western side of the Central Valley—in ox carts. This church became famous for being the first and only one built entirely with iron. The majestic structure was built using this material due to the determination of the citizens, who had lost two previous churches to different earthquakes. The current church was built in 1890. 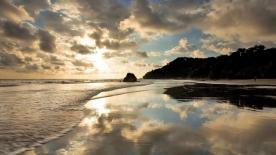 Costa Rica is much more than just beautiful beaches and breathtaking tropical landscapes. Once here, you can explore the culture, different traditions and festivities its citizens celebrate. During the past few years several local government entities have sponsored massive cultural events to attract locals and travelers, and create positive atmosphere of multicultural exchange. 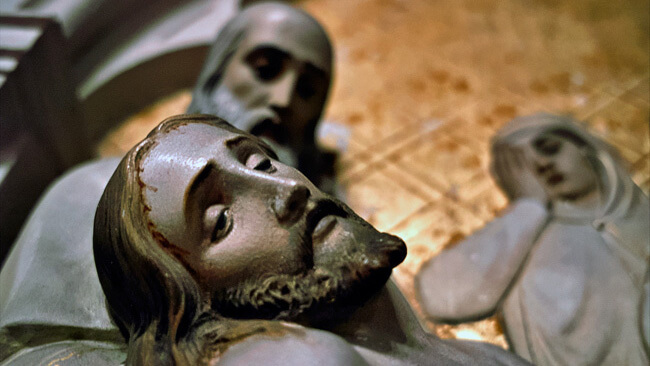 Knowing about semana santa and other main events will give you a great head start. The following are the three biggest cultural celebrations in Costa Rica besides Christmas, where you can experience some of the local spirit. A complete list of all national holidays is also available so you can prepare. If you come to Costa Rica for a family vacation just before Easter, you will witness a week-long celebration consisting of parades, religious processions & mini-festivals during ‘Semana Santa’. The processions are held in every city, but the one in San José is the best to see since it usually involves the cast of the National Theater Company and has a big production team featuring various bands and professional musicians. Banks and businesses will be closed Thursday and Friday, and public transportation is limited. In the tourism industry, everything runs as normal since this is a very popular time for people to visit Costa Rica. Throughout most of the country, alcohol is not sold from midnight on Ash Wednesday until midnight on Good Friday. It is actually against the law to sell or serve alcohol on Thursday and Friday during this week, so most Ticos make sure to stock up during the week, before all the liquor is locked up. If you don’t buy before then, it will be hard to find stores willing to sell it to you, especially if you’re vacationing in a less touristy area. In 2013, the state has started allowing some cantons (counties) to make their own decision about selling alcohol, so we might see this tradition fade away soon. But in the meantime, if you are traveling to Costa Rica during Semana Santa, you should keep this in mind and don’t be surprised if you aren’t able to order your favorite cocktail or beer with dinner during those two days. This celebration takes place on August 2nd, when the whole country celebrates Costa Rica’s patron saint, the Virgin of Angels, also known as ‘la Negrita’ or Black Virgin. The statue of the Black Virgin—believed to be indigenous representation of Virgin Mary—was found in the early 17th Century in Costa Rica’s former capital, Cartago. According to local folklore, the statue kept miraculously reappearing at the same site where it was originally found, so the locals decided to build a shrine on the very same spot, and it has remained there until the present day. The Virgin is displayed on the main altar at the Our Lady of Angels Basilica in Cartago. 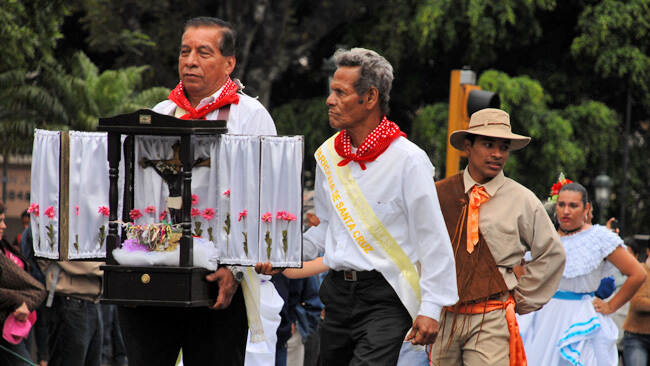 Nearly two million Costa Ricans walk the 13.6 miles from San Jose downtown to the Cathedral each year, in order to honor the legend of the Virgin Mary. Prior to the celebration you will see thousands of pilgrims walking from all corners of the country (and sometimes other areas of Central America) to get to Cartago. Some streets can be very crowded and traffic may be completely shut down in specific areas of the city. However, this is something that mostly affects San Jose and Cartago. You also may see peregrines in the days after August 2nd. Private services usually run normally, although public institutions and schools are off for the day. Costa Rica’s Independence Day is celebrated on September 15th. Unlike other countries in the region where armies perform pompous parades, Costa Rica celebrates its declaration of independence from Spain by organizing student parades. School children dress up in the national attire and go out to the main streets with colorful homemade faroles—lanterns. The celebration actually begins on the 14th as everyone awaits the ‘freedom torch’ that is brought in all the way from Guatemala by various runners (mostly students). This signifies the voice of the independence brought from Guatemala in 1821. Promptly at 6pm people pour out onto the streets, where the entire country sings the national anthem followed by the students’ faroles parade and fireworks. This day is celebrated locally with parades and music. You may spot and hear these activities at the nearest town, and some places may offer a special night commemorating Costa Rican folklore with concerts and dancing. Otherwise, it is a very peaceful event. As with Our Lady of Angels Day, private services usually run without changes, but public institutions are free for the day.